The holiday season can be a wonderful time to connect with friends and family. It can also be a time when expectations of ourselves, others, and events themselves are higher than usual, leading to stress and disappointment. 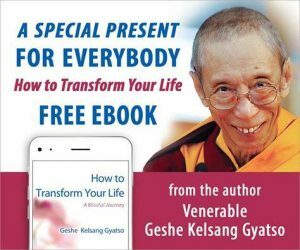 In this Friday Night Lecture, Gen Kelsang Gomlam will help us understand the causes of stress and unhappy thoughts in a light-hearted way, so that we can reduce them, and eventually, get rid of them completely. Then we can respond genuinely to every situation, conversation, or outcome with a positive mind and a good heart so that we enjoy a meaningful and stress-free holiday season. Cost: $10 before 11/23 for $15 after 11/23. Free for KMC Madison Members and Benefactors.